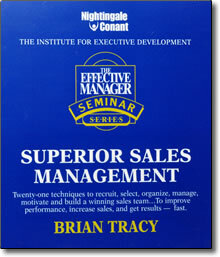 Superior Sales Management DVD by Brian Tracy – Discount! 21 techniques to recruit, select, organize, manage, motivate and build a winning sales team . . . To improve performance, increase sales, and get results — fast! Inspire and lead your sales force to be the best they can with the help of Brian Tracy’s vast sales management experience.